Excellent voice acting from some brilliant actors. An excellent script with some hilarious subtle humour. Though sometimes the joke was lost because it was almost too subtle. The film had the same jarring, jolting movements that I didn’t like in The Tale of the Princess Kaguya. 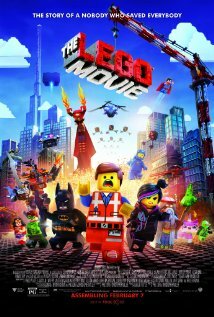 But it works in this film, because that’s exactly how you’d expect Lego people to move. The music was fun. Though now I have that damned song stuck in my head! I have to admit that I wasn’t altogether certain that I wanted to watch this movie. I expected it to be a terrible kids’ movie. But it has an excellent story. It’s about an “average Joe” Lego-man named Emmet who goes with the flow and does everything by the book to fit in with people who don’t even think twice about him. But after accidentally stumbling upon a “mystical” item, Emmet is thrust into a whirlwind adventure and must save his city and several others from the evil President Business, who demands perfection and order. But then there’s a giant plot twist and it turns out the whole movie is running in tandem with a little boy’s fantasy, playing with his father’s Lego cities. But his father doesn’t play with them. They’re only meant to be looked at, never played with. But when the father sees what his son has been doing down in the cities, he realises that they should be played with. The little boy is Emmet. His father is President Business. It is a film about the importance of being young at heart, that even though we grow up and have jobs everyday we must not lose our imaginations. For they are what hold us together. After the movie, I was pretty certain that the only reason the film was snubbed from an Oscar nomination for Best Animated Feature was because there’s a chunk of it that’s not animated. But then I looked up the Academy Award rules, and it says that in order to be eligible for Best Animated Feature, the film must be at least 75% animated. And I’m pretty sure the film was more than 75% animated, though I could be wrong. I mean, this is really the only reason why I justify it being snubbed for.